This chaos cast-on-crit bow Trickster was an experiment in Betrayal league, and wasn't very optimised at all, but still cleared everything I threw at it and was fast at mapping and delving. It was a total joy to play. The build got a huge buff for Synthesis league. ED damage is sky high. Quick theorycrafting shows ED damage can soar over 1 million dps. I actually think this could be one of the better builds this league. The only concern is the changes to fossils, since the build is dependent on a fossil crafted bow. In Synthesis, I will be optimising it as far as I can take it with the currency I will have (I'll be playing an occultist for this one, but Trickster will still work, probably with Escape Artist instead of Swift Killer). AS you can see from the gif above, like any ED/contagion build, this one excels in linear high density areas (like delves, this one was depth 215 or so). As long as the contagion spreads, you just run forward and watch things die. So below is the 3.5 guide with an updated PoB path. The guide should remain accurate otherwise. 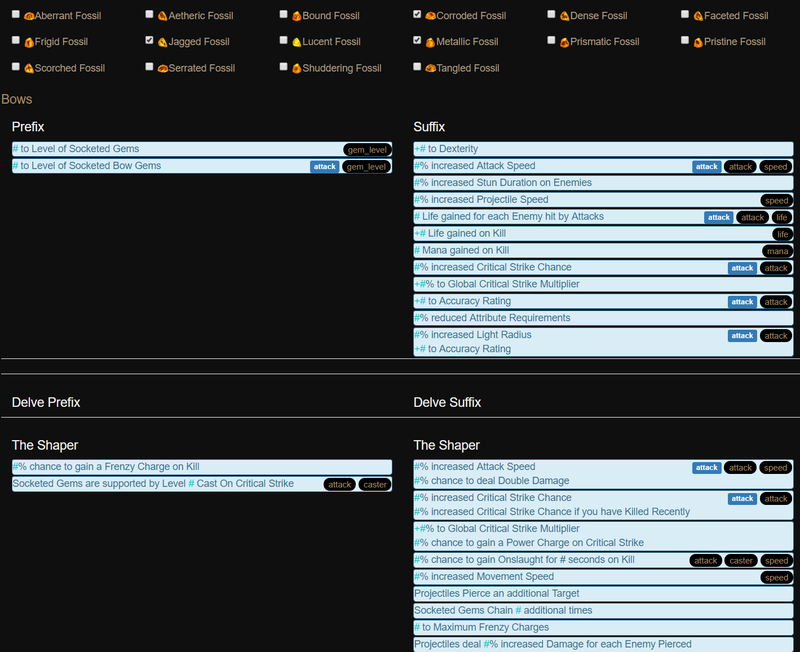 I've also added a leveling section for occultist. Another Pit of the Chimera, but with worst mods imaginable. +monster life +chaos res +crit +damage as X +vulnerability. Even playing super loose, no problems. Damage ceiling is over 1M single target, probably a fair bit higher. This is a cast on crit build that uses toxic rain to generate lots of hits for CoC, proccing ED and Contagion for clear, and a juicier ED for single target. The idea is that all major skills need the same supports (stacking chaos damage, damage over time, chaos multi), and then spell damage can boost ED further. WHY CAST ON CRIT FOR CHAOS SPELLS? There are several issues with the chaos spells that make life hard for self-casting. 1) Essence drain targeting: the projectile moves slowly, and can lag behind enemies. CoC solves this by auto-targeting, and toxic rain has both an initial hit and a delayed hit (both can crit) so it isn't unusual to see ED projectiles flying off behind you, clearing the mobs you miss. 2) Casting two spells per pack: If you want to clear as a caster, you need to cast contagion, then essence drain. With this build, you shoot once, and both spells proc in under half a second. 3) Essence drain doesn't stack for single target, meaning damage is capped unless you channel blight like a fool. In this build, you have a full powered toxic rain, which stacks, on top of a strong essence drain. I haven't got anywhere near the damage ceiling, but it is probably quite impressive. Toxic rain. You would give up all the beautiful synergy if you went a melee skill like Cyclone. It is a lot to balance, and something has to give. At the moment, I'm running a lowish crit rate, and lowish life pool. Higher crit rates are much smoother, and less critical stats like movespeed are pretty much ignored. Trickster: https://pastebin.com/KXuMFxmB (this is 3.6 ready, but I am not playing a Trickster this league so I can't vouch for it 100%). Occultist: https://pastebin.com/ezk2gKXS (unfinished, I intend to take Zealot's oath as per the PoB to get energy shield recovery from essence drain, but I haven't actually got there yet to test how well it works). 3.6 update: it is likely that concentrated effect will massively outperform void manipulation now, but testing is required to see how much it will hurt TR stacking. The bow is the one hard and fast requirement for the build. You need cast on crit and +1 socketed gems, and then craft +2 socketed support gems. So you only need to hit 2 out of 4 possible prefixes, and you are done! This is pretty ridiculous for a bow of this quality. You can add a serrated fossil as well if you want to waste a prime resonator, which will make IAS and critical strike chance more likely as suffixes, but it also adds another prefix back. This isn't the "perfect" bow, but it is close. The real problem is that all the other great mods (like chaos multi, more spell damage, and 104% increased spell damage) are all prefixes, and we are full. The suffixes available are really lacklustre (hint hint GGG). I happened to hit the one every other bow character wants (IAS, double damage), but the double damage doesn't work on DoTs. Ideally, you would use faceted fossils to get + 1 strength gems (for empower) and + 1 intelligence gems (for essence drain), but each faceted is over 1 ex right now, so that is pretty out there. Increased crit strike chance would be nice, and I could fit it on with multiple crafted mods, but the benefit for the extra few ex wasn't worth it for me. Jewels are pretty straight forward. Chaos damage, chaos multi, life, res, attack speed. I haven't really run the numbers, but adding more jewels and abyssals should help scale the build higher. The rest of my stuff is pretty much junk. Resists, life, some chaos multi, crit chance and accuracy. I have a +% crit chestpiece, which I could replace with a belly or kaoms (since I don't really need the sockets), but my crit is already too low at 36%. You don't need crit multi at all, since it doesn't do anything for DoTs. Up to you. I went with kill all, and Lunaris/Garukhan. Trickster? Quill rain with Toxic Rain up to mid maps. Easy as. As an occultist, it is probably more sensible leveling as a self-cast ED/contagion ... even though having to cast two spells is no fun. I've done this for Synthesis, and because of the feels bad, I decided to swap into CoC asap, using the cast on crit support. No damage supports (although cast on crit gives the spell a 20-30% more multi) - you need both cast on crit and increased critical strikes. Here is my leveling tree, which is currently life-based. I plan to transition into energy shield around 70-75. POB: Trickster https://pastebin.com/KXuMFxmB (this is 3.6 ready, but I am not playing a Trickster this league so I can't vouch for it 100%). Trickster and Occultist both look really viable. Going low life will boost ED damage a lot, but the new escape artist node for Trickster looks amazing. Can't be stunned, up to 36% increased attack speed, auto-recovery when hit. It is very tempting to go with the Trickster again. Unfortunately, without Swift Killer, you need another way to get power charges, or scaling crit chance gets hard. I don't have the perfect answer here. I went with Trickster because I didn't know how the build would feel, and didn't want to mess around with low-life issues on an occultist while I was learning. The occultist is probably the optimal choice though. Damage is better, safety is probably better. I'll play this next league. In PoB, my Trickster does 175k ED with <20k TR, a maxed out Occultist is closer to 700k, with a 55k TR. There is tons of scaling space left, albeit at a cost. My gems are no-where near maxed out. Getting lvl 21 ED/Contagion/TR and quality for all supports will cost a few ex, and lvl 4 empower is around 4-5 ex. Eber's Unification would boost damage (I couldn't be bothered improving resists elsewhere), as would Aspect of the Spider gear. Farrul's Fur/Bite adds a ton of crit as well as charge generation, so for the Tricksters you can drop Swift Killer and go with Escape Artist if preferred. An unsupported level 1 Vaal blight to pop on a boss would also spike damage a ton just from the "enemies take 20% increased chaos damage". If you wanted, it could go in a 6-link chest with full supports, since the tree is already built for chaos damage. Going low life is obviously the smart choice for damage, which makes Occultist the right option. There is another chaos cluster above occultist too. As far as Watcher's eyes go, I would probably boost defenses with a Grace modded version. 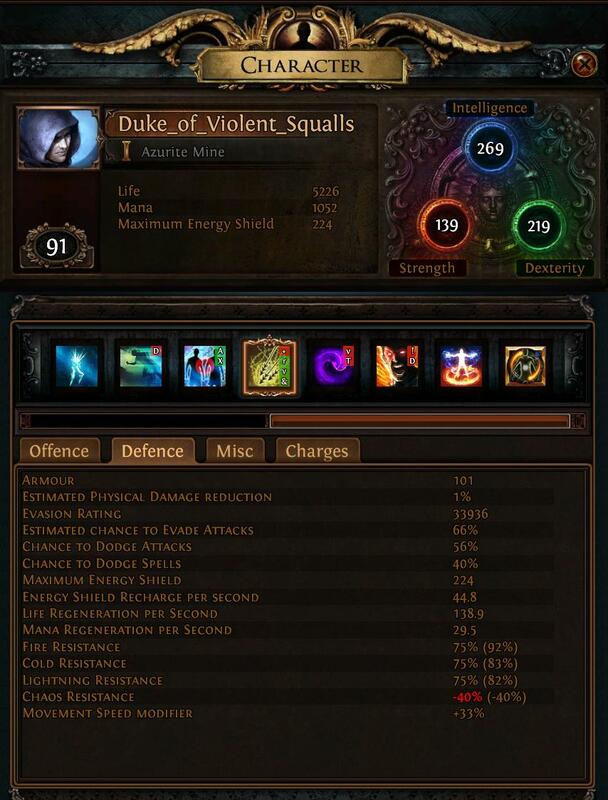 I will be playing this build again next league, so if anyone has suggestions of how to scale damage higher while also boosting crit rate, I'm all ears. The build feels a lot smoother once crit rate is > 50%, without power charges. As i read, it seems really bettter on occultist! Can you share your POB for the occultist ascendancy plz? I'm not too experienced at building low-life chars, but something like this? Ignore all the items and the amount of ES, I have only really filled out the tree and will need to try it out in-game. Looks pretty good though, damage is sky high. Trickster was about 250k ED in PoB before, low-life Occultist is ~700k.... pre-buff. Easily over 1 million I think, if we add in the buffed damage, the DoT aura, and possibly a new support gem for efficacy. I can't believe the build got such a huge buff ... this is gonna be great! What do you think about running Asenath's Chant to proc contagion? It would let you run supports for it and use efficacy dedicated in the 6L. So are you building this as Trickster now? Or as Occ? Yeah, it is ok. The attack speed and move speed is great, and the ES is ok if you are going ES. But, few issues. First, the build is socket limited right now (especially if you run Kaoms), so this takes up space that wither and blight could use. Second, you need resists elsewhere, and even with good gear it starts getting tight. Third, 25% per attack feels bad. The beauty of TR is multiple hits per attack (dozens, usually, after the pods pop). Only getting contagion off 1 in 4 attacks on average wouldn't be fun. To feel smooth, it needs to go off 70-80% of attacks. So, overall, I wouldn't. Contagion is only used for mapping, and you don't need the extra support for damage (seriously, with the buffs, nothing in the game above delve 300 will last a fraction of a second). In the last league I was running T16 +30% monster life, +25% chaos res maps and everything melted. Trade-offs just aren't worth it IMO. I just did a Trickster so I am gonna build an Occultist so I know how it feels. But a Trickster is super viable, especially since the main benefit of Occultist (low life ES) is probably viable as a Trickster (with the ES/evasion nodes). So, it would work as life Trickster and ES Trickster. Life Trickster is still the easiest and cheapest to build, I think. Been hugely buffed (both offensively and defensively), and I am pretty sure that if I had time last league before the buffs I could have done uber elder. The 3.6 PoB link still has trickster despite you saying youre playing Occultist, what abilities are you taking in occultist because it doesn't seem like you have many curses. I really want to play this build, it seems so fun. Does anyone have POB with tree for occultist with items? And maybe some leveling tips? Would be amazing. I was just working with the tree from Ghazzy's ED build, with the bow instead. I'm going to try leveling with ED/Contagion self-cast, but TR is still fine to level. Both skills are capable of 3:30-4:00 hr speedruns to Kitava I think, although I'm lucky if I can get < 6 hrs. This seems pretty neat. Since I haven't played the game since Incursion, I'm not that familiar with Delve/Fossil crafting. So my question is, how viable is this going to be as a league starter in SSF? Like, roll standard ED, which has been a league start staple for years now and then transition into this maybe?